Melody Overstreet and I will be co-teaching a workshop at the Santa Cruz Museum of Natural History on June 16th on seeds! This workshop will offer hands on-experience with seed saving and an opportunity to explore the life cycle of select native plants through art. 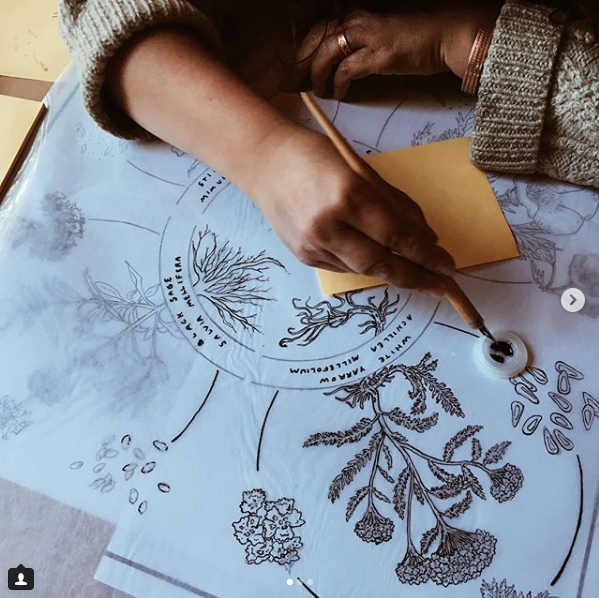 Each participant will have an opportunity to silkscreen print a seed-collecting bandana with an illustration featuring four local native plants. Registration is through the museum’s website. I would like to share with you that I will be showing work at Stripe Men in Downtown Santa Cruz for the month of December. There will be an opening reception this upcoming Friday, December 1st, from 5-9pm during the Santa Cruz First Friday event. I have been working on some new cyanotypes this year that I am excited to share. During the evening the store will be donating 10% of sales to the Homeless Garden Project. My friend Coco will also be there on Dec 1st for the Stripe Pop Up with her beautiful handmade ceramics. If you are around I would love to see you there! Excited to share that Melody Overstreet and I will be having an art show at the Bolinas Book Exchange that will be up from August 5th-31st. We will be sharing new work that we have been collaborating on over the past two weeks. There will be a small reception on August 5th from 4pm -7pm. I will be partaking in the Santa Cruz Open Studios Art Tour this year along with Melody Overstreet. We invite you to join us from 11:00 am-5:00 pm this upcoming Saturday and Sunday, October 8th and 9th as well as the following weekend, October 15th and 16th. I will also be demonstrating relief printing from woodblocks on a small press during both Sundays. 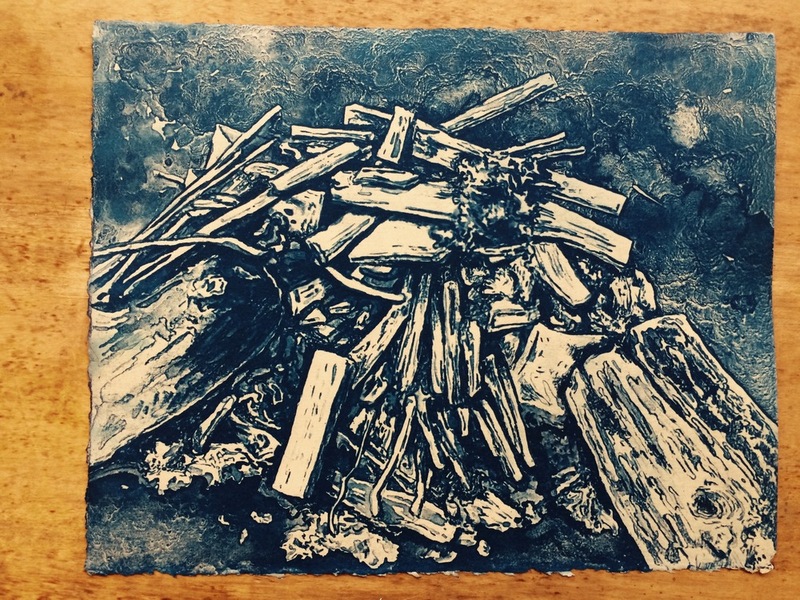 We will be sharing some recent prints, cyanotypes, and drawings. We will also have a variety of handmade items for sale including soaps, zines, canvas goods, and small home furnishings. There will be light refreshments, and good music in the air. Come join us at the Big Yellow House and take a gander at some art! I will be having an art show in July at the Gospel Flat Farmstand Gallery in Bolinas, CA. I am excited to be showing some cyanotypes and drawings that I have been working on this year in such a great space. There will be a reception this coming Saturday, July 2nd from 4-8pm. There will be some food to nibble on and live music featuring The Gospel Flatters, Jeff Manson, and Alex Bleeker. The show will be up from July 2nd through August 5th. More than a stones throw from home for some, but a beautiful trip to make. Hope to see you there! Hello! I currently have a selection of cyanotype prints I have been working on up at the store Stripe Men for the month of April. Stop by if you can make it! Hey Folks! I will be participating in Open Studios this year along with Melody Overstreet over at the Big Yellow House. We will be sharing relief prints, mixed media pieces, cyanotypes, drawings, and other items. Come on out! October 3rd & 4th as well as the weekend of the 17th & 18th from 11 - 5pm. This last month I was honored to participate with other printmakers to create art memorializing the 43 student teachers in Ayotzinapa. So far two exhibits have been lined up in Santa Cruz. The first one was at the Guelaguetza Festival at Harbor High on May 17. The second event is a show at the Santa Cruz Public Library, from July 12 though September 12, including a First Friday reception on August 7. Here is a Facebook Page with info about the movement. Insulated denim quart jar koozie design coming together. Opera, rain, & silly putty. A new table comes together. Almost ready for some wavy glass. Pattern magic. Let’s see if my math skills work.